According to the Egyptian priest/historian Manetho (3rd Century BCE) the Exodus of the Hebrews was from a city called Avaris, which had been the capital of Asiatic invaders called Hyksos. Archaeolgists today understand that Tell el-Daba is Avaris and nearby Qantir is Pi-Ramesses. 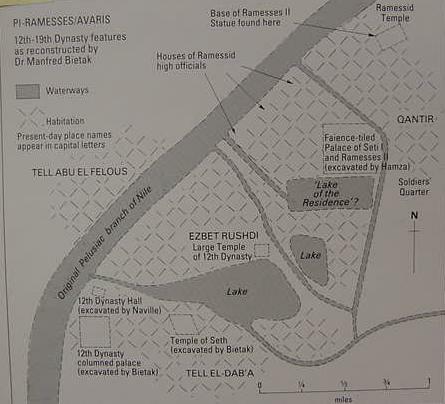 According to Professor Manfred Bietak, who is in charge of excavations at Tell el-Daba, Avaris was occupied in Ramesside times and served as a port for Pi-Ramesses (the "lake" above the temple of Seth being labeled a "port" by Bietak). According to Ian Wilson, Pi-Ramesses was quite large and embraced both modern Qantir and Tell el-Daba, thus he understands that Rameses of the Bible is both Avaris and Pi-Ramesses. (For the below map cf. p. 54. Ian Wilson. How many people lived at Pi-Ramesses ? Scholars are NOT in agreement as to the ratio of people living within an urban area in ancient antiquity, estimates vary from 100 persons per hectare to almost 500; for more details click here. 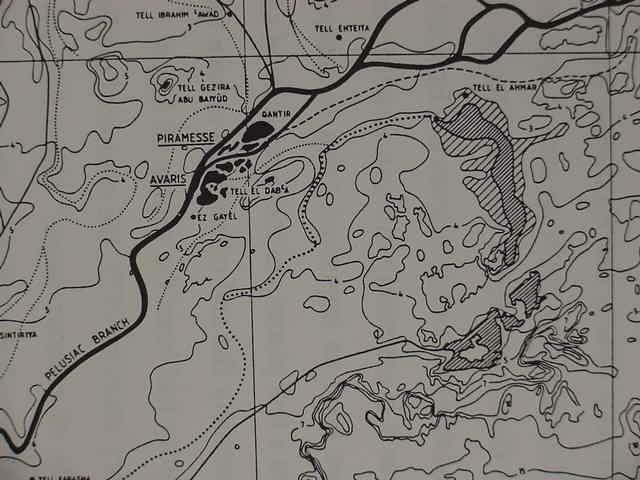 To the degree that Pi-Ramesses (Pi-Ramesse, Piramesse, Ramesse, Rameses) is approximately some 100 hectares in size, its population could be estimated at anywhere from 100,000 to 500,000 a truly large site (note: 1 hectare is the equivalent of 2.471 acres; 1 sq. Kilometer = 100 hectares). Of interest here is that some scholars date the Iron Age I fall of Lachish and Megiddo to the Hebrews as occurring sometime in the 12th century BCE -the same century that witnesses the decline of Pi-Ramesse- on the basis of cartouches found in those locations of Ramesses III at Lachish who reigned ca. 1182-1151 BCE and Ramesses VI at Megiddo who reigned ca. 1141-1133 BCE. At Hazor, the Israeli archaeologist, Moshe Dothan, excavated two sherds which he identified as being Philistine. To the degree that he has suggested the Philistines settling in Canaan ca. 1176 BCE in the days of Ramesses III as the Pelest, this discovery might suggest that Hazor fell AFTER the Philistines had arrived in Canaan. How long after 1176 BCE Hazor fell is anybody's guess, but if it was at the same time as Meggido and Lachish, then its demise may have been ca 1130 BCE, about the same time Piramesse is going into decline according to Professor Kitchen. I note that some scholars have suggested that the loss of a large pool of Asiatic slave labor must have been economically felt by the Egyptians and there would have been "economic repercussions" especially at the site of biblical Rameses. Is there a relationship here between the 1130 BCE or 12th century BCE DECLINE of Pi-Ramesse and a 12th century ASCENDANCY of an Iron IA Israel, who may have destroyed Lachish, Megiddo and Hazor ca. 1130 BCE ? If Dothan has correctly identified the two sherds he found at Hazor as Philistine, then his discovery at Hazor would appear to "somewhat support" the biblical notion that the Philistines were in Canaan _before_ Joshua and the Israelites took the city (cf. Exodus 13:17, 23:31;Joshua 13:2, 3). 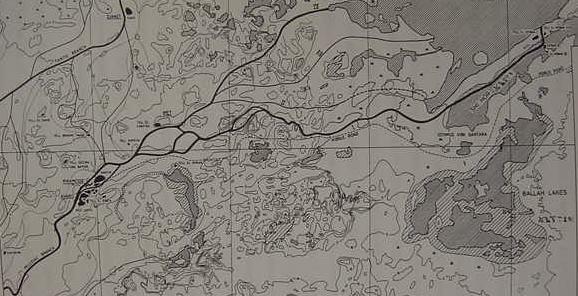 According to Uphill Pi-Ramesses is a site possessing approximately 1500 ha (hectares), other sites noted are Heliopolis (Egyptian Inu/Anu, biblical On, cf. Ge 41:45) 2300 ha; Thebes 740 ha; Memphis 460 ha; Elephantine (near Aswan) 4.5 ha (cf. Eric P. Uphill. Egyptian Towns and Cities. Shire Publications, Ltd. England. 1988. ISBN 0852639392. A paperback of 65 pp. with transparencies. Uphill is an Honors Research Fellow in the Department of Egyptology at University College, London). The largest city in Canaan in the Late Bronze Age (1560-1200 BCE) and Iron IA period (1220-1150 BCE) was biblical Hazor, which the Bible states was "the head" of the Canaanite kingdoms before its being torched by Israel (Josh 11:10-11). Hazor's size is roughly 200 acres, consisting of an upper city or citadel of roughly 30 acres and a walled lower city of 170 acres (cf. p. 595. Vol. 2. Ammon Ben-Tor. "Hazor." Ephraim Stern et. al. Editor. The New Encyclopedia of Archaeological Excavations in the Holy Land. New York. Simon & Schuster. 1993). Professor William G. Dever notes in passing a rough population "estimate" frequently employed by some archaeologists of 100 PERSONS PER URBAN ACRE (please click here for details). Using his observation, Hazor's 200 acres might suggest a population of about 20,000 when the Iron IA invaders captured and destroyed the city. 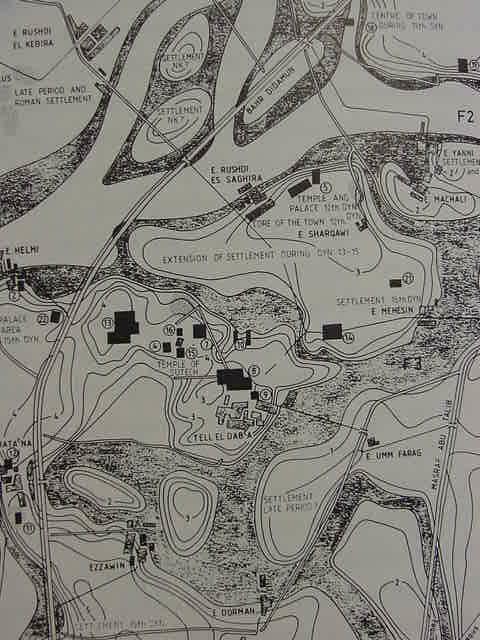 One hectare = 2.471 acres, thus Pi-Ramesses' 1500 ha = 3,706.5 acres; Dever's 100 persons per acre = 370,650 for Pi-Ramesses' population. According to Clayton Ramesses II led an Egyptian army of approximately 20,000 troops across the northern Sinai via Gaza, to do battle with the Hittites at Kadesh on the Orontes river in Syria. I note that this army is approximately the same size as Israel's population in the Exodus from Egypt as suggested above by professors Kitchen, Mendenhall and Humphreys. Humphries' 20,000 emigrating "Israelites" would constitute 5% of Pi-Ramesses' population; if Weham's 72,000 is factored in "Israel" constituted roughly 19% of Pi-Ramesses' population. If Clark's 140,000 is considered then Israel made up 37% of Pi-Ramesses' population. The Bible tells us a "mixed multitude" accompanied the Israelites in the Exodus (cf. Ex 12:38). If 140,000 emigrated then 37% of Pi-Ramesse's population "left" for Canaan. The Bible suggests for some scholars that 600,000 men left Rameses (cf. Ex 12:37), that is "more than double" the city's entire population of 370,600 using Dever's rough estimate of 100 persons per urban acre (some scholars have suggested 100 persons per Urban HECTARE) ! Using Dever's 100 persons per Urban acre, what chance did Hazor's population of 20,000 have against 50,000 or 70,000, or 140,000 "former residents" of Pi-Ramesses ? If we allow l/3rd of the urban population to be of warrior age, Hazor's 20,000 would have a defending force of 6000 men as oppossed to Israel's 16,650 or 23,310 or 46,620 Israelite warriors. Is it any wonder then, that Hazor would seek to rally ALL of Canaan to "beef up" her military force to withstand Israel at the waters of Merom (Joshua 11:1-5) ? The Israeli archaeologist, Moshe Dothan found two sherds at Hazor which he identified as being Philistine. Noting that he dated the Philistine presence in Canaan to ca. 1176 BCE in the reign of Ramesses III, this suggests _to me_ that Hazor must have fallen AFTER 1176 BCE (for the details please click here). Using Stager's 250 persons per hectare X Bietak's Hyksos Avaris of 250 hectares = 62,500 persons. One reason for some scholars rejecting an Exodus from Pi-Ramesses is that NO trail of Late Bronze Age (1560-1200 BCE) or Iron IA (ca. 1220-1000 BCE) campsites has been found in the Sinai, Negev and Arabah, places where Israel wandered. Another objection is that the Iron IA pottery resembles Canaanite forms, NOT Egyptian. In addition the claim has been advanced that the Egyptians make no mention in their records of an Exodus. Kitchen understands that the Exodus was in Ramesside times and that the window of Pi-Ramesses' existence as a Pharaonic capital is the 13th/12th century BCE, its zenith of power being the 13th and its decline occurring during the course of the 12th century, the same timeframe that Iron IA Israel suddenly appears in Canaan's Hill Country and in Trans-Jordan. For him there is a relationship here. As regards the absence of a "pottery trail" from Pi-Ramesses to Canaan, and that there is no evidence _whatsoever_ of a Late Bronze Age presence in the southern Sinai, Kitchen counters that there is Late Bronze Age presence of Egyptians at the Egyptian mining camps near Serabit el Khadim and Wadi Maghara. He has argued that despite the fact that archaeologists have NOT documented a "pottery trail" from Egypt to these camps, they nevertheless are proof that the Egyptain annals about trips to mine Turqoise, Malachite and Copper are verifiable by the debris in the mining camps. In other words, the failure to document a pottery trail from Egypt to the southern Sinai mining camps does NOT negate the Egyptian annals' statements about expeditions to this region. He argues that the brief window of Pi-Ramesses' existence as a capital in the 13th/12th century BCE mirrors the sudden appearance of Iron IA settlers in the Hill country of Canaan- he needs "no pottery trail" from Egypt. I might add to Kitchen's above rebuttal, which makes mention "only" of a Late Bronze Age presence at Serabit el Khadim, that Ramesside cartouches of the 19th Dynasty are attested at the same site. So, Finkelstein and Silberman are in ERROR in claiming that there is NO evidence of a Ramesside presence in the southern Sinai. One of the "immediate predecessors" of Ramesses II was Pharaoh Horemhab, who designated Ramesses I as his successor. Horemhab's cartouche exists at Tell ed-Dab'a on a lintel to a temple erected to honor the Egyptian god Set or Seth, and his cartouche has also been found at Serabit el Khadim. In fact, Ramesside cartouches through Ramesses VI (who reigned ca. 1141-1133 BCE) exist at Serabit el Khadim's Egyptian temple erected to the honor Hathor, the mining godddess, who, as the celestial sky-cow-goddess, gave birth to the sun each morning as the Golden Calf. I find Kitchen's argument regarding "missing" campsites compelling and convincing. I am reminded here of _the failure_ by archaeology to document "any camp sites" of Ramesses II's 20,000 troops which crossed the Sinai to Gaza and on to Kadesh on the Orontes. The Assyrians under Sennacherib (ca. 704 BCE) devastated Judah. His palace walls in Nineveh show in bas-reliefs the destruction of Lachish, and the evidence is everywhere in the Tells of Iron II Judah of the damage he wrought, but _not one camp site_ has ever been found within Judah or in the wilderness between Nineveh and Judah. Still later, Sennacherib's son Esarhaddon (681-669 BCE) marched Assyrian armies consisting of thousands of soldiers across the Sinai to subdue and conquer Egypt, yet not one Assyrian campsite has been documented in the Sinai. Nebuchadrezzar and his Babylonians destroyed Philista and Judah in the 6th century BCE and the fire-blackened Tells of these areas bear witness to this event, yet NOT a single Babylonian camp site for his army has ever been documented between Babylon and Jerusalem or in Judah. Some scholars understand Nebuchadrezzar also marched a Babylonian army across the Sinai to attack Egypt. He was repulsed, but to date not one campsite of this army has been found in the Sinai. Napoleon Bonoparte (ca. 1798) marched his soldiers accross the northern Sinai from Egypt to invade Palestine and then back again to Egypt, yet no camps of his have ever been found either. If historians can "allow" that thousands of warriors in Ramesside, Assyrian, Babylonian and French armies crossed various portions of the Ancient Near Eastern world including the Sinai, leaving NO archaeological evidence of their camp sites, then it is "inappropriate" to insist that the Israelites' camps sites must FIRST be documented between Egypt and Canaan BEFORE the biblical account can be regarded as credible. The Assyrian destruction of Judah relayed in the Bible is accepted by most historians because the burned tells of Iron II Judah appear to "align" with the bas-reliefs and inscriptions of Sennacherib found in Nineveh, Not because a "pottery trail" exists of an Assyrian army between Nineveh and Jerusalem. So, what do we "have" for "archaeological evidence" regarding an Exodus from Pi-Ramesse in Egypt to Canaan and Trans-Jordan in Iron IA ? We have a number of sites mentioned in the Exodus event which were destroyed "sometime" in the course of the 13th-12th centuries, when Pi-Ramesse was in existence: Hazor, Megiddo, and Lachish. We have the general area of Hill Country Canaan suddenly exploding with over 200 settlements whereas earlier only about 60 settlements existed. We have Iron IA sites appearing in the Negev near Arad at Tel Masos and Wadi Yattir which somewhat "aligns" with the biblical notion Israel settled here about the time of Exodus and Conquest. On the "negative" side a number of sites mentioned in the Exodus did NOT exist in the LBA to be destroyed in Iron IA, Ai (et-Tell), Arad, Heshbon, Dibon and Beth Horon. Does this mean that there was "no" Exodus because not all sites existed in the Late Bronze/Iron IA interval ? I "suspect" that the Exodus account as we have it was written in the Exile ca. 560 BCE, and that the Late Iron II peoples IN ERROR thought that some sites existing in their day had existed at the time of the Exodus and were destroyed then. Until Sir Flinders Petrie developed pottery chronologies tying them to Egyptian cartouches, no one had any idea how old any site was. So, just because the Iron II writer of the Exodus account had relayed some incorrect information about the existence of Ai, Arad, Heshbon and Beth Horon, does not mean the "baby should be thrown out with the bathwater." The fact that there was a sudden explosion of villages in an area where the Bible has Israel settling, makes sense for those advocating that the mention of a town called Rameses in Egypt as where the Exodus began, aligns "somewhat" with the Ramesside era Iron IA settlements sudden appearance. It also aligns somewhat with Manetho's notion of the Ramesside expulsions of "scabby lepers" from Avaris. As regards the "absence of Egyptian pottery in the Iron IA settlements," (it being assumed by many scholars that after 430 years in Egypt Israel would have forgotten Canaanite pottery forms and rendered her pottery in an Egyptian manner and style) and the use of Canaanite forms, several proposals have been advanced. Israel may not have brought pottery with her, using water skins (as argued by Kitchen) or she may have used it up via "breakage" during her 40 years of wandering in the wilderness ? I note that the Bible states that Israel left with a "mixed multitude", all were not Israelites ( Ex 12:38). Eighteenth and Ninetenth Dynasty annals, carved on stone, mention raids into Syria-Palestine putting down repeated revolts and bringing back captives in the thousands to slave in Egypt. Perhaps this 500 year steady flow of Canaanite captives "kept alive" Canaanite potting traditions in the Eastern Delta, so that when these Asiatic slaves "returned" to Canaan in Ramesside times they _still wrought their pots in the Canaanite manner_ rather than the Egyptian manner ? Only petrographic analysis of clays in the Iron IA pots will reveal if any are of the soils of Egypt, the Sinai, Negev, Arabah and Trans-Jordan, places Israel wandered in according to tradition. The Iron IA villages do have clay cooking pots, invaders need to eat and cook their food, so the small portable cooking pot would be the best item to test petrographically. Amihai Mazar and the Late Yohanan Aharoni, both noted that the Iron IA pottery of the highlands of Canaan, while "resembling" Late Bronze Age Canaanite forms, also DIFFERED. The manner of making the lips or necks of the jugs as well as the surface decoration was NOT the same as that found in the Lowlands, where some scholars (Dever) posit refugees fleeing from corrupt city states to begin life anew in the Highlands. They CORRECTLY noted, if these were refugees, why weren't the pots executed and decorated in an IDENTICAL manner of the Lowland settlements ? If we allow the DIFFERENCES to be the result of Canaanite slaves in Pi-Ramesse, keeping alive their earlier Canaanite potting traditions, then we have an answer as to why the pots are NOT identical to the Lowlands of Canaan in Iron IA. Another possible answer may be that the Bible tells us that Israel INTERMARRIED with the Canaanites, and thus via intermarriages, Canaanite potting practices were adopted and adapted (Judges 3:5, cf. below). ALTERNATELY, Manetho "may have" the answer to unlocking the mystery which has so for so long "bedeviled" trained archaeologists' constantly reappearing question: "Why, if Israel has been in Egypt for 430 years, isn't the pottery and houses in the Hill Country villages of Iron IA Egyptian in form?" Most archaeologists have accordingly REJECTED on these TWO ANOMALIES any notion that Israel migrated from Egypt, for them the archaeological evidence in unequivocal, the pottery in Canaanite is appearance and the so too the dwellings. Thus new proposals are advanced for who the makers of the Iron IA Villages in the Canaanite Hill Country are. For Professor William G. Dever, they are Canaanites fleeing the oppressive city sates in the Lowlands; for Israel Finkelstein, they are Canaanite "nomads" dwelling on the fringes of Canaan with their flocks who decide to invade and settle down. For Abraham Malamat they are Canaanite Hapiru of the Amarna Era, with perhaps invaders driven by famine and war from northern Syria to merge with the Hill Country Apiru. I am NOT aware of any of these scholars giving any serious consideration of Manetho's claims. In fact, I am just as guilty as they until this past week (25 Dec 2004)! According to Manetho, after the Hysos expulsion, Avaris (Tell ed-Dab'a ?) lay abandoned for a period of approximately 500+ years according to Josephus' reckoning. Then Manetho has Avaris being rebuilt and occupied by Lepers who had earlier been banned to the quarries opposite Memphis, but allowed later to settle at Avaris. They invite Asiatics from the Jerusalem area to come settle at Avaris, the invite is accepted and apparently a very large contingent arrives and soon takes control of the area, recalling somewhat the Hyksos arrival and takeover of Lower Egypt some 500+ years earlier. After 13 years at Avaris according to Manetho, an Egyptain army routs them from Avaris along with rebellious scabby leper-Egyptians and they return to the Jerusalem area in south Canaan. Could it be Manetho is CORRECT ? The reason WHY the Iron IA pottery in the Hill Country villages of Canaan RESEMBLES Canaanite pottery is because it IS CANAANITE (as surmised by the archaeologists, Dever, Finkelstein, and others). That is to say, after some 13 years at Avaris (Tell ed-Dab'a) the RETURNING south Canaanites of the Jerusalem area are BACK in their homeland, Canaan, and during their brief 13 year sojourn at Avaris they have NOT forgotten how to make their Canaanite pottery or build their Canaanite four-room houses ! In other words, I understand that Manetho's account of an invasion of Canaanites from the Jerusalem area (south Canaan) and their expulsion back to the same general location by a Ramesside pharaoh to be VINDICATED by the archaeological evidence found in the Iron IA Villages with their "Canaanite pots and Canaanite four-room houses"! 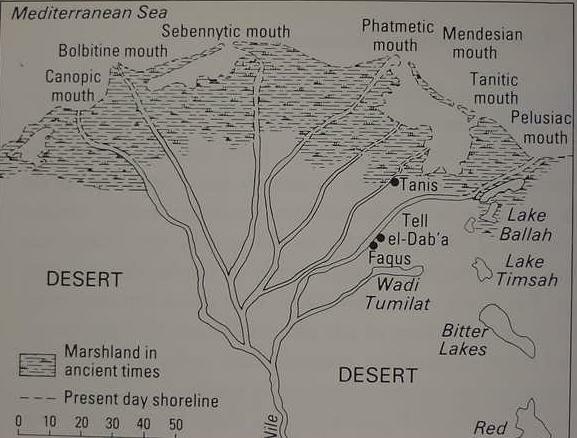 Manetho stated that Pharaoh Rameses expelled from Avaris (Tell ed-Dab'a) not only the Israelites but a "mixed rabble" of "polluted scabby lepers" some of whom were Egptians, originally culled from Egyptian society and banned to rock Quarries near Memphis, then they were later moved north to Avaris, which had been vacated by the Hyksos some 500 years earlier. Does archaeology VINDICATE Manetho to _any_ degree ? That is to say, if Manetho's account of a Pharaoh called Ramesses being responsible for the Hebrew Exodus is to be given any credibility, then "_at the minimum_", there MUST be evidence of an occupation of his Hyksos Avaris in Ramesside times ! No Ramesside occupation of a site abandoned by Manetho's expelled Hyksos means Manetho is full of hot air and is not to be believed. Egyptologists have documented the presence of Pharaoh Horemhab's cartouche on a stone lintel found at a temple erected to honor the Egyptian god Set or Seth at Tell ed-Dab'a/Avaris according to Bietak (cf. fig. 61, p. 77, for a drawing of the lintel. Manfred Bietak. Avaris, the Capital of the Hyksos, Recent Excavations at Tell el-Dab'a. London. British Museum Press. 1996). Bietak also found evidence of Tell ed-Daba being a Hyksos site which was abandoned at the beginning of the 18th dynasty- AGAIN, CONFIRMING MANETHO. The Ramesside 19th Dynasty came to power under Ramesses I, who is believed to have co-ruled with Horemhab, the last Pharaoh of the 18th Dynasty. Rameses I built a palace at Qantir according to Kitchen, which was later expanded into the megapolis city of Pi-Ramesses by his son Ramesses II. Over time, Pi-Ramesses expanded into Tell ed-Dab'a and the former Hyksos site became a suburb of Pi-Ramesses ! It is _my_ understanding then, that ARCHAEOLOGY HAS VINDICATED MANETHO! Avaris (Tell ed-Dab'a) did exist in Hyksos times, was abandoned and resettled in Ramesside times. Thus Manethos' claim that Israel was expelled from Avaris by a Pharaoh called Ramesses is ON THE MARK, and a number of scholars are IN ERROR in _dismissing and overlooking_ his understanding that the ancient records of Egypt _now no longer available to us_ DID INDEED preserve the Exodus event as being Ramesside! Ramesside annals carved in stone mention forays into Syria-Palestine putting down revolts and bringing back slaves, some of whom must have been Canaanites. So, it is not to be wondered that the pots in the Iron IA villages of the Canaanite Hill Country "resemble" Canaanite potting traditions, the Canaanite "slaves" were returning to their homeland, and apparently, they had kept their Canaanite potting traditions alive when brought as captives to Pi-Ramesses by the Ramesside pharaohs. As noted earlier (above) Manetho claimed that the Hebrew Exodus was from Avaris. The Bible claims the Exodus is from a store-city called Rameses. The 1st century CE Jewish Historian Flavius Josephus understood that Manetho's Avaris was biblical Ramesses. Josephus, however, was emphatic that Manetho was in ERROR in placing the Exodus under a pharaoh called Ramesses, for Josephus -using the Bible's chronology- the Exodus must be Manetho's Hyksos "Shepherd Kings" who had been expelled some 500 years earlier than Ramesses' time. I understand that BOTH Manetho and Josephus are "CORRECT" and that the Bible's Exodus is fusing both events, Hyksos and Ramesside, thus the reason why the Bible preserves Ramesside details, but a Hyksos chronology. I note that a number of scholars have NOT taken into consideration regarding the alleged "absence" of any information about a Hebrew Exodus from Egypt in Ramesside times, the statements of the Egyptian priest Manetho, who claimed to have based his History of Egypt on archival documents at his disposal in the 3rd century BCE. He stated that the Hebrew Exodus WAS A RAMESSIDE EVENT. So the claims of some scholars, like K.A. Kitchen, James K. Hoffmeier, William G. Dever, James Weinstein, Abraham Malamat, Israel Finkelstein and Neil Asher Silberman, that there is NO EVIDENCE from Egyptian records of a Ramesside Exodus are seriously flawed -there is evidence, as preserved by Manetho, who has been pretty much IGNORED and or DISMISSED by many scholars. While Kitchen is probably right, that "defeats" would NOT be monumentalized, I do recall that Ramesses II proudly monumentalized his "victory" over the Hittites at Kadesh on the Orontes. When the Hittite archives were found however, it was clear that Ramesses' victory was actually a defeat, in that he was unable to oust the Hittites from former Egyptian territory, the victory was more of a "stalemate." Manetho's observations are important here, he stated that the Hebrew Exodus was NOT A DEFEAT for Egypt, it was a VICTORY! Pharaoh Ramesses had EXPELLED "rebellious SCABBY lepers" from Egypt! Of interest here is the term "scabby lepers," leperousy is a form of skin disease; I note that the mummified body of Pharaoh Ramesses V ( reigned ca. 1145-1141 BCE) had small-pox lesions or scars on his face. Perhaps Manetho is recalling small-pox SCABS? If Ramesside Egypt was beset with recurring outbreaks of deadly small-pox, the quaranteening of afflicted "scabby-lepers" to quarries may have been a health measure to prevent the spread of small-pox amongst the Egyptian population. "The Lord said to Moses, "Yet one plague more I will bring upon Pharaoh and up[on Egypt; afterwards he will let you go hence; when he lets you go, HE WILL DRIVE YOU AWAY COMPLETLY." According to Manetho, that's just what Ramesses did, he DROVE away the plague-afflicted scabby-lepers from Avaris (Tell ed-Dab'a/Qantir/Pi-Ramesses), saving the Egyptians from further spread of disease! The biblical account claims Israel was "enslaved" by the Egyptians out of fear they might turn against the Egyptians and join Egypt's enemies (Ex 1:8-10). Of interest here is that Ahmose saw the Hyksos as "rebels and enemies" of Egypt who had to be destroyed and enslaved (his elder brother Kamose claiming he would make the Hyksos his slaves and have them press wine from the Hyksos garden's for his table). Manetho's account accuses the Hebrews of being rebels as well to Ramesses' authority. So, then Egyptian records, (Kamose and Ahmose I) as well as Manetho speak of Asiatics in the Delta as Egypt's enemies who have turned on her. As noted, earlier above), a number of scholars have REJECTED Manetho as a "credible witness" to a Ramesside Exodus of the Hebrews. They apparently DOUBT that Egyptian records preserved the event as related by Manetho. Instead they claim that by the 3rd century BCE Jews had settled in considerable numbers in Egypt and that Manetho learned from "second-hand sources" hostile to the Jews of their mention in their holy scriptures of lepers being amongst Israel in the wilderness and Moses' leprosy. I have given (above) my reasons for believing Manetho is correctly relating what the ancient archival records preserved. Why ? Because archaeology substantiates his "broad" outline of events, a place called Avaris, occupied by Asiatic invaders who are expelled, then Avaris is abandoned for roughly 500 years, then it is reoccupied in Ramesside times and its Asiatics are expelled by a Ramesside Pharaoh. The "scabby leper" statement made by Manetho is _for me_ substantiated in the small-pox lesions on Rameses V's face. 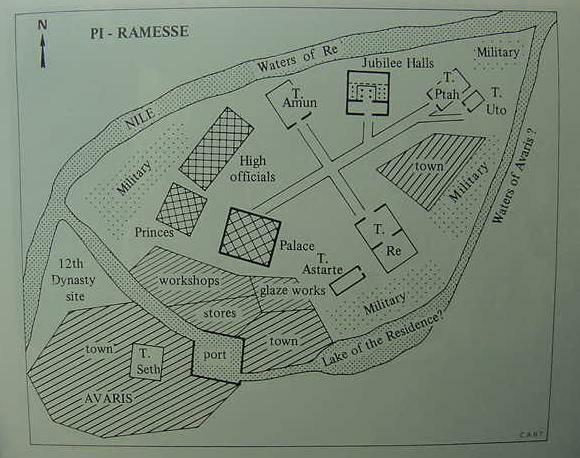 According to Kitchen Pi-Ramesse continued to be occupied as a royal residence down to ca. 1130 BCE (cf. above), Ramesses V reigned ca. 1145-1141 BCE, so if he contracted small-pox _AT_ Pi-Ramesses, then "the plague" that ravaged Ramesside Egypt and precipitated the Exodus was small-pox. That is to say, even Pharaoh himself was not immune from the scourge, and perhaps members of the royal house may have even died of it, said deaths being reformatted and "embellished" by the Hebrew Bible as an overnight sudden death of thousands of Egyptians ? I note here that Bietak noted mass burials in Hyksos Avaris suggesting a plague had decimated the population; could this have been an earlier outbreak of small-pox or some other disease? In Manetho's account the "expelled" are the ones who suffer a disease or to use biblical terminology who are afflicted with disease. But in the Hebrew account, an INVERSION has occurred, its the Egyptians who are diseased NOT the Hebrews ! I have documented elsewhere what I consider a penchant of the Hebrews for using INVERSIONS in their "re-interpreting" of Mesopotamian myths (cf. my artcle titled Genesis' Genesis and the Pre-Biblical Origins of the Sabbath), perhaps the plague wrought by God on Egypt, is but ANOTHER INVERSION? When Pi-Ramesses came to be abandoned, it became in effect a stone quarry for building blocks to erect and beautify nearby Tanis (biblical Zoan, Egyptian Djanet). Manetho characterized the expelled Asiatics and Egyptians as rebellious scabby lepers and associated with them a quarry at Memphis. Perhaps what also might be called here is that the abandoned Pi-Ramesses come to be remembered as "the quarry of the scabby lepers" who were expelled by a Pharaoh Ramesses? Finally, by what "mechanism" did the Hyksos and Ramesside expulsions preserved by Egyptian records _apparently_ available to Manetho, come to be preserved in the Hebrew Bible? We are told that after the initial destruction of various Canaanite sites, Israel in later generations married the Canaanites and adopted their gods; among the Canaanites that Israel intermarried with, were the Jebusites of Jerusalem. If the Bible is correct, then it was the Iron I (ca. 1200-1000 BCE) Canaanite-Jebusite fathers and mothers who would teach their Israelite sons and daughters the stories of their ancestors expulsion/exodus from Egypt in Hyksos and Ramesside times. "So the people of Israel dwelt among the Canaanites, the Hittites, the Amorites, the Perizzites, the Hivites, _AND THE JEBUSITES_, and they took their daughters to themselves for wives, and their own daughters they gave to their sons;and they served their gods." Manetho stated that both expulsions, the Hyksos and the Ramesside, although separated by some 500 years, began at the SAME place, Avaris, and ended at the _same location_, JERUSALEM! Many scholars understand that the priests at Jerusalem during the course of the 9th-6th centuries BCE were responsible for bringing together the oral traditions of their ancestors and setting them down in written form as the Hebrew Bible as we have it today. Why wouldn't the Iron I "Jerusalem-Jebusite ancestors" of Iron II Israel/Judah NOT pass on their traditions of the Hyksos and Ramesside expulsions to their Israelite descendants who would eventually become "priests" at Jerusalem? Apparently by late Iron II times, the 9th-6th centuries BCE, the two expulsions had become fused into ONE Exodus account, hence the Hyksos chronology preserved in the Bible and the Ramesside details. I have had some recent queries about "where" the Israelites lived. The proposal was made that although Israel may have "built" the storecity of Rameses, they did not live in it, but outside of it, somewhere else in the "land of Goshen." The problem here, is that in antiquity the Nile flooded the Delta each year. The ONLY place suitable for year-round habitation was the elevated landforms within the Delta, which became in effect, "islands" when the annual innundation arrived ( cf. 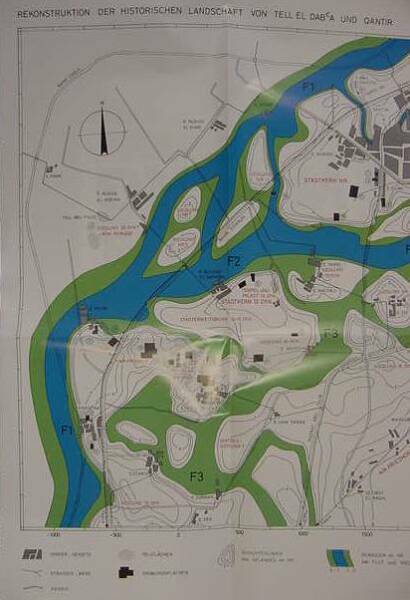 the above maps of Pi-Ramesse by Bietak, showing the site to be a series of elevated landfroms in black). To the degree that the Bible has the Exodus _beginning_ at Rameses, I understand that the Asiatics must have dwelt with the Egyptians on these elevated landforms, to avoid being annually "flooded-out." The Bible does tell us that on Passover eve, blood was smeared on the LINTELS of the buildings that Israel dwelt in to avoid the Angel of Death (Ex 12:22). This suggests to me that the building of houses in an area subject to annual flooding is unlikely. However, I would appreciate hearing from anyone, if in fact, the Egyptians did erect homes in the Flood Plain in antiquity (perhaps the flooding at Pi-Ramesses was an occasional or rare event, worth taking the risk of dwelling on the plain?). The problem before us is sifting out the fiction from the truth. Scholars have noted that ALL ancient histories are "rife" with errors and fictions, and the modern historian's task is not to accept everything in these ancient histories as "gospel truth" but to critically probe and test these histories' statements and "cull out" the untruths, misunderstandings and later "embellishments"or "spin." I might "add" here, that I understand that Manetho, an Egyptian priest who wrote a history of Egypt in Greek in the 3rd century BCE for his Ptolemaic Greek overlords, stated that there were TWO expuslions of Asiatics from the eastern Delta in antiquity, according to the Egyptian records he had at hand. The first was the Hyksos expulsion from Avaris, and 500 years later, a Ramesside expulsion from the same Avaris (it being resettled in Ramesside times according to him). He thought the Exodus was a Ramesside event, however, the Jewish historian, Flavius Josephus (1st century CE/AD) disagreed, and averred it was the Hyksos expulsion because the biblical chronology aligned better with the earlier expulsion. My research suggests both were right, and that the Exodus account written ca. 560 BCE in the Exile has fused both expulsions and recast them with a Hebrew "SPIN." According to Manetho both expulsions were VICTORIES for Egypt. The Hebrew account is that the Exodus was a VICTORY for their God. According to Manetho it was an "act of self-preservation" that lead the Egyptians to gather up and expell "rebellious scabby-lepers" and thus prevent the spread of leprosy amongst the Egyptians. In other words, the Egyptian account suggests _the expelled were the AFFLICTED and DISEASED_. The Hebraic account states that God _did not_ AFFLICT Israel, he afflicted the Egyptians ! In other words, it appears to me that what we have here, if Manetho's Egyptian sources are correct, is a Hebraic INVERSION of the event. Instead of acknowledging their ancestors were driven from Egypt as "god-afflicted, diseased scabby-lepers", it is the Egyptians who are diseased and afflicted, and who drive them from the land after the deaths of many of their countrymen. In other words what we have here are TWO SIDES TO THE SAME COIN. Who's right? Who's SPINNING who here? I note that Pharaoh Ramesses V's mummy has small-pox lesions on its face, and small-pox in its early contagious stage has scabs, which, if picked, leave skin lesions or scars. Is it possible that the "plague" afflicting Rameside Egypt was small-pox? Did the Egyptians cull from their ranks the diseased and later expell these diseased from Egypt to prevent the spread of the epidemic? Are there any clues in the Bible to Manetho's account of Egypt's expelling "God-afflicted diseased Egyptians and Asiatics"? The Exodus account in the Bible mentions Moses contracting leprosy as well as Miriam. Both are healed, in Miriam's case, she is quaranteened without the camp for 7 days, then readmitted. The quaranteen for chicken-pox is 7 days (during this period the disease is contagious and scabs appear on the body). The Bible also mentions other "lepers" within the Israelite camp in the Sinai, being expelled as well. Perhaps the god-afflicted scabby-lepers expelled from Egypt by a Pharoh Ramesses in Manetho's account, explains the biblical scenarios of leperousy rife among the Hebrews in the wilderness? In other words the Hebrews have INVERTED events, it wasn't JUST Egyptians who were afflicted with plague (Small-pox and Chicken-pox?) it was Israel too! Thus the Exodus is recalling real events but putting a "spin" on them, God did NOT afflict his people with disease in Egypt, he afflicted the Egyptians, which is partly true, to the extent that Manetho acknowledges that diseased Egyptains were culled and put into quaranteen at stone quarries opposite Menphis before their transfer to Avaris and later expulsion for rebellion and sedition. It is probably also true that some Egyptains did DIE in the smallpox epidemic if such existed (noting the smallpox lesions on Ramesses V's face), and that the Hebrews in reformatting and embellishing this event, had God smiting all the firstborn in one night (an impossibility according to medical science). Those scholars claiming that there is NO mention of the Exodus _in non-biblical records_, that is, Egyptian records, are IN ERROR, the account was preserved in the Egyptian records apparently abstracted by Manetho. But the Exodus in Egyptian eyes was a VICTORY not a DEFEAT. Manetho avers that the expulsion was from Avaris, identified by Professor Bietak and other scholars with Tell ed-Dab'a. Pi-Ramesse is understood to have been founded nearby at Qantir and eventually it spread and encompassed Avaris as a suburb, hence, Pi-Ramesse gave its name to Avaris, and became Rameses of the Bible where the Exodus began. Of interest here is that Psalms has Moses confronting the Pharaonoic court in the "fields of Zoan" NOT at Rameses (Ps 78:12, 43). Why? Well, archaeologists have excavated Zoan (Greek Tanis, Egyptian Djanet) and have discovered that its only Ramesside occupation is very late 20th Dyansty, the very eve of the 2lst Dynasty (beginning ca. 1060 BCE) which made the site Egypt's new capital. This is "too late" for Israel to be at Zoan and confronting a Ramesside Pharaoh and then appearing in Canaan in Merneptah's victory stele of ca. 1208 BCE. So, why portray Israel at or near Zoan instead of Rameses (Pi-Ramesse)? The answer for me is that in putting a "SPIN" on the smallpox epidemic (? ), the Hebrews had claimed their God afflicted the Egyptians with disease but NOT his own people, thus, it was NECCESSARY for the story-line, to have Israel dwelling "apart from" the rest of the Egyptians, so as NOT to affected by God's plagues. That location became the "fields of Zoan." Manetho said the expulsion of the diseased scabby lepers was from an earlier abandoned CITY called Avaris, _not_ Zoan Djanet/Tanis and its nearby fields. The Bible does however, acknowledge that the Exodus begins _at_ Rameses, NOT Zoan or its fields (Ex 12:37). Thus it is my understanding that Manetho's Egyptian archival sources (which do not survive today) did indeed preserve and record the Exodus, but as a Victory and not a Defeat. For purposes of "face-saving" the Hebrews portrayed the event as God's Victory over their oppressors. So, both accounts apparently possess elements of historical fact, but each has "tweaked" and embellished somewhat the storyline to makes its' God/Gods " the Victor." According to Graham the "earliest" mention of Zoan in Egyptian records is on a building block from Memphis cut during the reign of Ramesses II, who is generally acknowledged as making Pi-Ramesses his Delta capital. Manetho had stated that Ramesside Egyptian "lepers" were settled at Memphis in a nearby quarry before being allowed to later settle at the abandoned Avaris. Could this Memphite building block be "evidence" in support of Manetho's statement ? Could this block also be evidence for the Israelite notion that she dwelt in the "fields of Zoan" while building Pi-Ramesses ? However, to date, no evidence exists of an occupation at/near Zoan (Greek Tanis, modern San el-Hagar) of the days of Ramesses II. The earliest "Ramesside" era cartouche found so far at Avaris (Tell ed-Dab'a?) is on a stone lintel of a temple erected to honor the Egyptian god Seth, of Pharaoh Horemhab, who later associated Ramesses I as a co-ruler. Horemhab's tomb shows Asiatics pleading to be allowed to settle in Egypt, their homeland having been devastated in war. Did Horemhab (and Ramesses I) allow the settlement of Asiatics from south Canaan at Avaris (Tell ed Dab'a), employing them in the site's reconstruction? If so, this would "align somewhat" with Manetho's statement of the Hyksos' descendants from the Jerusalem area being allowed to settle at Avaris in Ramesside times. Manetho stated that these Asiatics eventually established rule over the east Delta area for 13 years before being expelled by a Pharaoh called Ramesses. The Hebrew Bible (The Old Testament for Christians) apparently understands that a location called the "fields of Zoan" existed about the same time as the biblical storecity of Rameses. The Memphite building block mentioning Zoan cut in the days of Ramesses II, who is generally credited with making Pi-Ramesses his Delta Capital, would appear to "support somewhat" the biblical notion that a location called Zoan was known to Ramesside era Egyptians. Manetho understood that the Hebrew Exodus was a reformatting of a Ramesside expulsion of the Hyksos' descendants who had resettled in Avaris in Ramesside times. The modern village of Qantir (Khatana-Qantir) marks what was probably the ancient site of Ramesses II's great capital, Pi-Ramesse or Per-Ramesses ("House or Domain of Ramesses" ). This city is situated about 9 kilometers (5.5 miles) north of Faqus in Sharqiya province of the eastern Nile Delta (about 60 miles north-east of Cairo). It is known that Ramesses II moved the ancient Egyptian capital from southern Egypt into the Delta, probably both to escape the influence of the powerful priests at Thebes, and to be nearer to the costs of modern Turkey and Syria in order to protect Egypt's borders. The location of this city, well known from documentation, was long in question. However, in the 1920s, decorated tiles, including some with the name of Seti I and Ramesses II were discovered in the area. More recently, beginning in the 1970s, the site was examined by a German expedition, and the Austrian Archaeological Institute under the direction of Manfred Bietak. They have been using magnetometer (gradumeter) to map out the long lost city. This relatively new method of archaeological discovery is mostly non-intrusive, and in many cases where the land is agricultural in nature, is the only suitable method of exploring a site. By late 1999, some 75,000 square meters had been measured in the fields around Qantir, and domestic areas, administrative quarters of a vast palace-temple compound, a possible cemetery and a region with poorer houses were defined. Their work firmly established the site as Pi-Ramesse, with ruins stretching as far as Tell el-Dab'a to the south covering an area of some thirty square kilometers. Edgar Pusch, head of the German archaeological team, tells us that, "Something like this has never been detected before in Egypt". The computer plottings made by the team show winding streets, structures that look like small houses, spacious buildings, palaces and a lakeshore. Some of the amazing finds include a huge stable, to which was attached royal chariot and arms factories." Ten kilometers equals roughly six miles, so thirty square kilometers is roughly 18 square miles for the size of biblical Rameses! Braidwood's 200 people per urban Hectare would equate to a population of 600,000 for Rameses. Renfrew's 300 people per urban Hectare would place Rameses' population at roughly 900,000 souls. Frankfort's 494 people per urban Hectare would make Rameses' population approximately 1,482,000. Dever's estimate of 100 persons per urban acre suggests a population of 250,000 for Pi-Ramesses. Ammon Ben-Tor. "Hazor." p. 595. Vol. 2. Ephraim Stern et. al. Editor. The New Encyclopedia of Archaeological Excavations in the Holy Land. New York. Simon & Schuster. 1993. Manfred Bietak. Avaris, the Capital of the Hyksos, Recent Excavations at Tell el-Dab'a. London. The British Museum Press. 1996. Manfred Bietak, Editor. Agypten Und Levante [Egypt and the Levant]. Vol. IX. 1999. International Journal for Egyptian Archaeology and Related Disciplines. Vienna, Austria. ISBN 3-7001-2850-9. Peter A. Clayton. "Ramesses II." pp. 147 & 150. Chronicle of the Pharaohs, the Reign-by-Reign Record of the Rulers and Dynasties of Ancient Egypt. London. Thames & Hudson. 1994. Geoffrey Graham. "Tanis." pp. 348-350. Vol. 3. Donald B. Redford. Editor. The Oxford Encyclopedia of Ancient Egypt. New York. Oxford University Press. 2001. James K. Hoffmeier. Israel In Egypt, The Evidence for the Authenticity of the Exodus Tradition. New York. Oxford Univesrity Press. 1996. K. A. Kitchen. On the Reliability of the Old Testament. Grand Rapids, Michigan. William B. Eerdmans Publishing Company. 2003. K. A. Kitchen. Pharaoh Triumphant, the Life and Times of Ramesses II. Warminster, England. Aris & Phillips Ltd. 1982, 3rd corrected impression of 1985. Magnus Magnusson. Archaeology of the Bible. New York. Simon & Schuster. 1977. Edgar B. Pusch. "Piramesse." p. 50. Vol. 3. Donald B. Redford. Editor. The Oxford Encyclopedia of Ancient Egypt. (3 vols). Oxford University Press. 2001. Lawrence E. Stager. "The Impact of the Sea Peoples in Canaan (1185-1050 BCE)."pp. 332-348. Thomas E. Levy. Editor. The Archaeology of Society In the Holy Land. New York. Facts On File. 1995. Eric P. Uphill. Egyptian Towns and Cities. Shire Publications, Ltd. England. 1988. Ian Wilson. The Exodus Enigma. London. Wiedenfeld & Nicolson. 1985. Dating the Exodus, Josephus' Hyksos Expulsion vs. Manetho's Ramesside Expulsion. Below, Professor Kenneth A. Kitchen's, as he calls it, "imaginative reconstruction" of Pi-Ramesse (cf. p. 123. fig. 42. K. A. Kitchen. Pharaoh Triumphant, the Life and Times of Ramesses II. Warminster, England. Aris & Phillips Ltd. 1982, 3rd corrected impression of 1985. ISBN 0-5668-215-2. paperback).